Sorts a data set to one or more output data sets. Sorts the indd data set to the outdd data sets (up to 10). DFSORT control statements and options can be used to copy a subset of the input records, reformat records for output and so on. Used for a JOINKEYS application. JKFROM must provide a USING(xxxx) operand. In xxxxCNTL, a JOINKEYS statement must provide with F1=ddname1 for the F1 file and a JOINKEYS statement with F2=ddname2 for the F2 file, as well as JOIN and REFORMAT statements as needed. TO, USING, or TO and USING must be specified. DD statements must supply for the ddnames you specify. Below example to sort the employee records based on employee state(from 50th column of length 2). 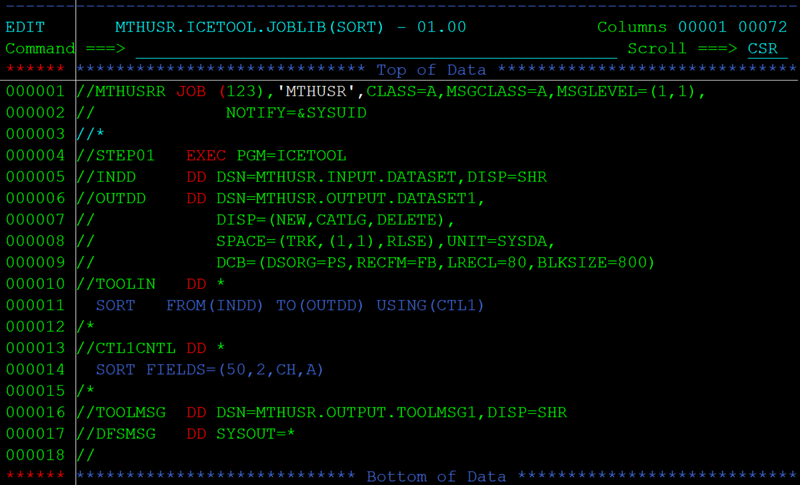 SORT FROM(INDD) TO(OUTDD) USING(CTL1)	-	Sorts the indd records and copies to OUTDD based on the selection criteria in CTL1. SORT FIELDS=(50,2,CH,A)	-	Sorts the records in ascending order based on the data from 50th position of length 2.